Lisa has been working with Lovelane’s able-bodied lesson program since 2011. 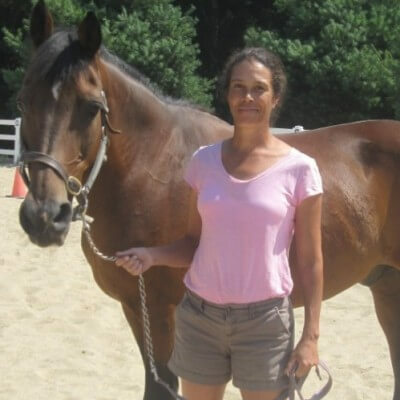 In 1997, she began teaching able-bodied lessons at Elsie’s barn in Weston in the early days of the Lovelane program and has been proud to see the high quality of care that has consistently gone into the horses and therapy. Lisa worked graduated from Morven Park International Equitation Institute in Leesburg VA in 1981. At the time, this was the only credible riding school run by the British Horse Society standards. Lisa loves working with children and adults. She enjoys seeing how proud students are of their accomplishments and how excited they are to tell their parents about what they learned after a lesson. When Lisa’s not at Lovelane, she teaches and rides dressage. She belongs to a group of trainers called Dressage Trainer’s Network, and is on the show committee for the Southern New England Driving Society. Lisa also has a 1/2 Saddlebred/Warmblood cross who is schooling at the 4th level. Lisa lives on a small farm with her husband and spends time there recuperating horses for the MSPCA Equine Center, Nevin’s farm.